Where did Pablo Picasso grow up? Pablo Picasso grew up in Spain where he was born on October 25, 1881. His father was a painter and art teacher. Pablo liked to draw from an early age. Legend has it that his first word was "piz", short for "pencil" in Spanish. It soon became apparent that Pablo had little interest in school, but was an extremely talented artist. When he was fourteen Pablo attended a famous art school in Barcelona. A few years later he went to another school in Madrid. However, Pablo was bored with the classic teachings of art school. He didn't want to paint like people hundreds of years ago. He wanted to create something new. In 1901, Pablo's close friend Carlos Casagemas committed suicide. Pablo became very sad. Around the same time he began painting in Paris. For the next four years his paintings were dominated by the color blue. Many of the subjects were sad and somber looking. He painted people with elongated features and faces. Some of his paintings from this period include Poor People on the Seashore and The Old Guitarist. Eventually Pablo got over his depression. He also fell in love with a French model. He began to use warmer colors in his paintings including pinks, reds, oranges, and beiges. Art historians call this time in Pablo's life the Rose Period. He also began to paint happier scenes such as circuses. Some of his paintings from this period include The Peasants and Mother and Child. 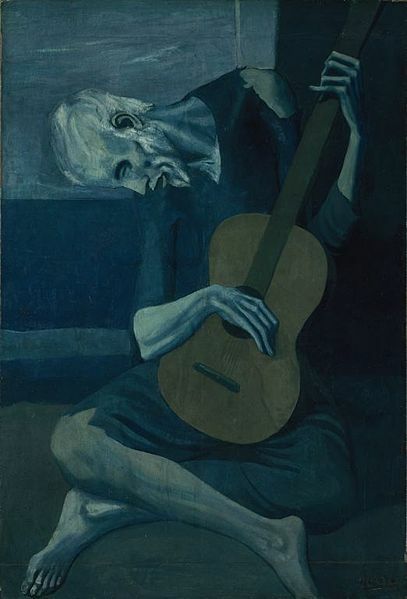 In 1907 Picasso began to experiment with a new style of painting. He worked with another artist named Georges Braque. By 1909 they had created a completely new style of painting called Cubism. In Cubism the subjects are analyzed and broken up into different sections. Then the sections are put back together and painted from different perspectives and angles. Go here to see an example of Picasso's Cubism art. In 1912 Picasso began to combine Cubism and collage. This was where he would use sand or plaster in his paint to give it texture. He would also apply materials such as colored paper, newspapers, and wallpaper to his paintings to give them added dimension. Some of Picasso's Cubism paintings include Three Musicians and the Portrait of Ambroise Vollard. Although Picasso would continue to experiment with Cubism, around 1921 he went through a period of painting more classical style paintings. He borrowed ideas from Renaissance painters such as Raphael. He created powerful characters that almost appeared to be three-dimensional, like statues. Some of his works in this style include The Pipes of Pan and Woman in White. Around 1924 Pablo became interested in the Surrealist movement. Surrealist paintings weren't supposed to make any sense. They often appear like something you would see in a dream or a nightmare. Although Picasso didn't become a member of the movement, he did incorporate some of their ideas into his paintings. Some people called this time his Monster period. Examples of the surrealism influence on Picasso's art include Guernica and The Red Armchair. Today, Pablo Picasso is considered the greatest artist of the 20th century. Many people consider him to be one of the greatest in all of art history. He painted in a number of different styles and created many unique contributions to the world of art. Near the end of his life he painted a number of self portraits. One of his last works of art was a self portrait done with crayon on paper entitled Self-Portrait Facing Death. He died a year later at the age of 91 on April 8, 1973. His full name is Pablo Diego José Francisco de Paula Juan Nepomuceno María de los Remedios Cipriano de la Santísima Trinidad Ruiz y Picasso. Wow! His mother once told him when he was a child that "If you become a soldier, you'll be a general. If you become a monk you'll end up as the pope." In the 1930s Picasso became fascinated with the mythical creature the Minotaur. This creature had the body of a man and the head of a bull. It appeared in many of his pieces of art. He produced over 1,800 paintings and 1,200 sculptures. Many of his paintings have been sold for over $100 million! He was married twice and had four children. Note: Any artwork used that is not public domain is used under the U.S. fair use laws because this is an educational article about the painting or image. The images used are low resolution. If you own the copyright and have issues with us using the artwork, please contact us and it will be removed promptly.